Home Blog Which are the Best Silver Dishwashers in 2017? 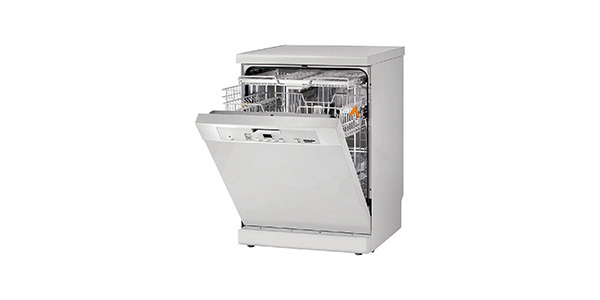 When shopping for a dishwasher, you’ll notice the huge number of options that are available. With the modern machines, you have so many more choices than you did in the past. 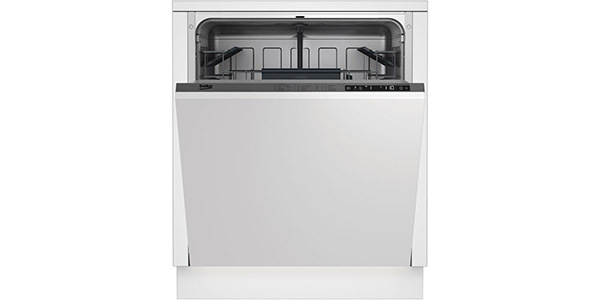 You have dishwashers that offer high tech features like sensor washing, a range of options for racking and machines that can fit different capacities. As an additional point, you have more choices when it comes to the colour or finish of the appliance. As always, you can select the machines that come in the classic white finish, but now you have options like stainless steel, black and silver. Furthermore, you may even find the odd dishwasher that comes in colours like pink, blue, green or red. While this will have no impact on the operation of the machine, or how useful it will be in the home, it can still be an important consideration. In some cases, white appliances might stand out in comparison to the colour scheme of the rest of the kitchen, and getting a black or silver dishwasher might just look better. As a shopper, it is nice to have the additional option to select a colour that will look better in your kitchen, but you still want to make sure that you are getting a dishwasher that will serve you well. Fortunately, you have several choices when it comes to getting a silver dishwasher, so it shouldn’t be hard to find a machine that is both the right colour and one that fits all of the functional requirements that you have. 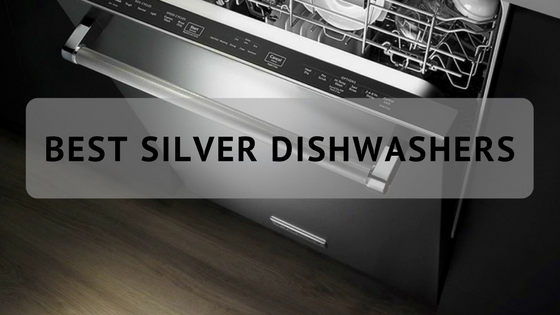 Before we move on to looking at our picks for the best silver dishwashers, let’s take a closer look at some of the points that may be important in getting the right appliance for your home. 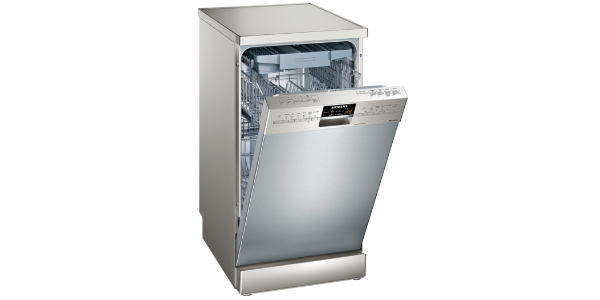 For a buyer, there could be a number of different reasons that they might prefer a silver dishwasher. It might be to match the other appliances or it could be that it fits in better with the rest of the room. Regardless, you know that there is more to getting the right dishwasher than selecting the colour. In this section, we are going to look at a few of the points that can have an impact on your decision. If you want a more thorough breakdown of what it takes to find the right machine, you might be interested in reading our dishwasher buying guide. 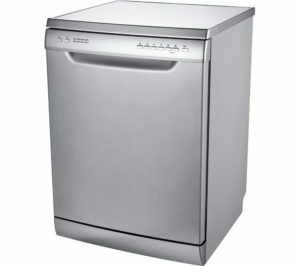 You can also read silver dishwasher reviews here. 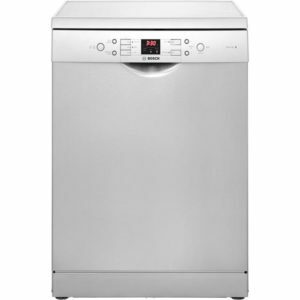 If you are just looking for a basic dishwasher, then the options for programs and features might not be that big of a deal for you, but many consumers do like to have a range of options for washing their dishes. You might want a sanitizing wash, a glassware cycle, automatic sensor washing, a half load feature or the ability to speed up the cycle times. The capacity of the dishwasher may be another important point. If your family goes through a lot of dishes in a day, then you might want to look for a machine that has the ability to hold more dishes. If you find that you only use a few dishes on a regular day, then you might even find a slimline model will be adequate for needs. With modern dishwashers, you have a lot of options for the design of the racks. You can still find machines that have very few adjustable options, but there are machines that have features like a third level cutlery tray instead of the basket, the height-adjustable top rack and special compartments and racks for specific items. 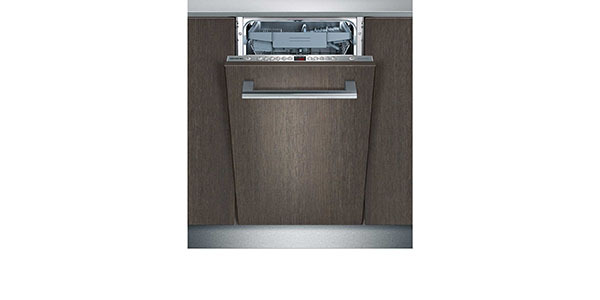 The design of a dishwasher’s interior will not only affect the amount of dishes that you can fit inside, but it also has an impact on versatility and ease of use. While the racks are one element that can affect the ease of use for a dishwasher, there are other factors that you may want to consider. If you are considering a machine that has a lot of features and options, then you might want to take a look at the control panel. If the controls are well laid out, then it will still be easy to operate even with a lot of options. 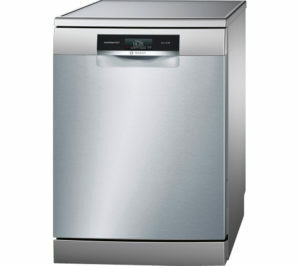 It is definitely what you would consider a high-end appliance, but if you can afford it, there are few dishwashers that can match up to the Bosch Serie 8 SMS88TI26E. This machine uses a range of advanced technologies to deliver superior washing and it comes with a great range of features and options. 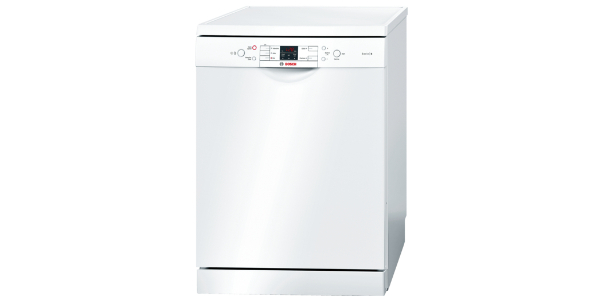 When it comes to the cleaning results, this Serie 8 dishwasher from Bosch does a great job. The machine comes with automatic sensor washing for ease of use and efficiency, and it has options for an ultra-quiet night wash, eco, super, a 30-minute quick wash and the auto programs include a low temperature, regular and a high temperature wash. In addition to that, this dishwasher has glass care, a time saver, a half load option and the machine has Wi-Fi direct, allowing the user to manage and monitor the operation using a Smartphone app. The designers at Bosch have also done a great job laying out the interior and designing the racks. The SMS88TI26E has a 13 place setting capacity, it has folding tines in both compartments, the third level tray for the cutlery, and it has a top basket that is height-adjustable to three different positions. 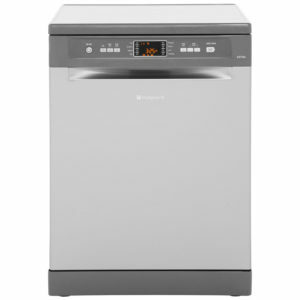 The Hoover Dynamic DYM762TX is a great dishwasher, and when you consider everything that you get for the price, it makes for an exceptional value. This machine can fit up to 16 place settings, it has great range of programs and features and it offers quality cleaning for all of your dishes. Most users will be more than satisfied with all of the options that they have for washing dishes. The machine 12 wash programs including options like your standard daily wash, eco, night, quick wash, glassware, hygienic and steam. This machine uses touch controls, it has a display screen on the front and it can be controlled and monitored from your Smartphone using the Hoover Wizard app. Being able to fit 16 place settings makes this machine good for families that have a lot of dishes to wash, and the interior is versatile for a good range of racking options. It has the height-adjustable top basket, special racks for large utensils and it offers a good level of versatility for fitting in awkward items. Who’s offering the cheapest deal on the Hoover Dynamic DYM762TX? 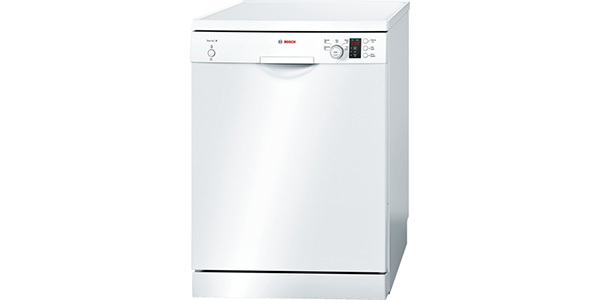 With the Bosch Serie 6 SMS53M08UK, you have a quality dishwasher that is easy to use and it is built to last. This machine can fit up to 13 place settings in one load, it comes with a good number of options for programs and features and it is a user-friendly appliance. The SMS53M08UK from Bosch provides the user with great cleaning capabilities and it does not require a lot of effort to use. For programs, you have an auto wash for your normal setting, an intensive wash, and eco wash, a pre-rinse and a quick wash that runs in about half an hour. It comes equipped with the Bosch AquaMix system, so you do not need a specific setting for protecting your glassware, you have features like a time saver to cut the cycle times and it has an intensive zone feature. The racks on this Bosch silver dishwasher are well laid out and the machine is easy to load and unload. It has a top basket that can be adjust to three stages, you have folding tines in the both baskets and it has special racks that can fold out for items like knives and large utensils. 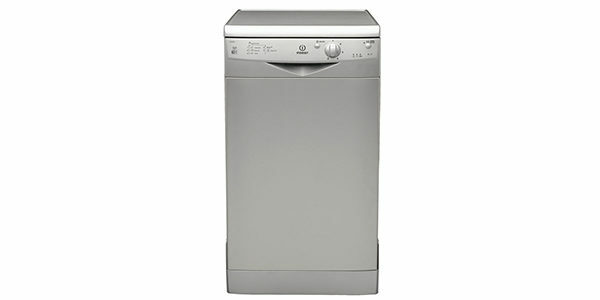 The Hotpoint Futura FDFEX11011G is a good dishwasher for the price. It has an interior that can fit up to 13 place settings per load, it has a great range of programs and it comes with some nice features. 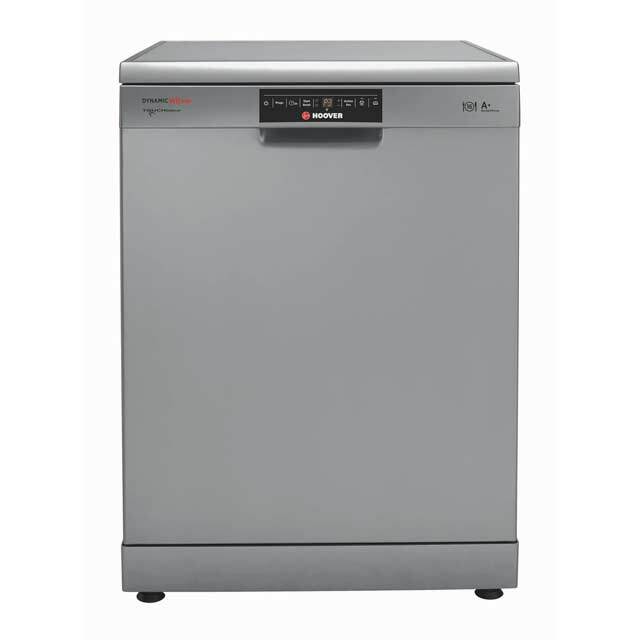 If you are looking for a machine that performs well on a range of tasks while also being easy to use, this is one of the best silver dishwashers that you will find. With the FDFEX11011G from Hotpoint, the user has 8 program options from which they can choose. For cleaning dishes, you have options like normal, fast, intensive, eco, soak, sanitizing, express and delicates. It performs well on all of these tasks, but users may find that the eco cycle takes a bit long and the express wash is fast, but it really only performs well for lightly soiled dishes. As additional options, it does have features for extra drying, half load and it has a time saver to cut the cycle times. The interior of this machine is fairly versatile and it is easy to load. There are models that do score better in this area, but this model does have the height-adjustable top basket and there are folding racks and compartments. As an additional point, the controls are very simple and easy to understand, so users should not have a hard time learning to use this machine. 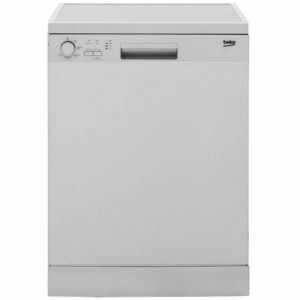 If you are working on a tight budget and just want a cheap silver dishwasher that is reliable and gets the job done, the Beko DFC05R10S is a model that is worth looking into. It may not have the most impressive array of features and programs that you will find, but it covers all of the basics and it does perform well. Even at this low price, it does come with a good selection of features and programs. For washing dishes, the user can choose from options like intensive, eco, mini, quick & shine and clean & shine. The mini cycle runs in about 30-minutes, so it is a good quick wash, and none of the cycles take an excessively long time to run. In addition to that, this machine also has a half load feature, so you can save some money when you don’t have a full load to run. One area where this machine does come up short is in the versatility of the racking. In total, it can fit up to 12 place settings, but you don’t get a lot of options for adjusting the racks. It is easy to load, and you can fit all of the more common items in the machine, but this could be an issue for some users.